The Hamilton Children's Aid Society is apologizing to a city woman for mistakenly disclosing confidential information about her to her business partner. 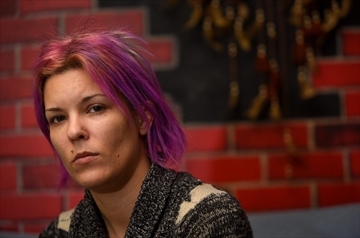 Ayla Smith, 28, says the breach happened after her partner Robert Johnston, with whom she also shares an apartment, requested a copy of his file over recent allegations made about him. Inside the more than 300 pages released to him, he received information about Smith that included comments about her time in care of the CAS while she was a youth, and that made reference to her as a drug user and alcohol abuser, which Smith insists is dead wrong. "He was definitely surprised to read that information," says Smith. "There was information I wasn't even aware of — that I was a drug addict when I absolutely did not take drugs." "I can't risk money we get (from the business) going to drugs and alcohol," he says. Smith and Johnston own a painting and renovation company called Splatters That Matter, which they launched in September. It is currently on hold and not operating as a result of the CAS disclosure, says Smith, a talented artist who also paints murals, and Johnston. CAS executive director Dominic Verticchio confirmed some information about Smith was released to Johnston in error. "She has every reason to be angry and we'll provide her with an unqualified apology," he said. The CAS sent the matter to its legal department, which will issue a letter of apology before the end of the week, he added. Smith, who first complained to the agency in mid-December, received a letter from the CAS on Dec. 23 saying it was investigating and would contact her the first week of January. But Smith says she hasn't received anything yet and more importantly, has received no apology. Verticchio said a formal apology is coming. He also said he is undertaking to have staff undergo better training. "We're upfront that we sent some information that we shouldn't have," he said. "I'm not defending the CAS. We made an error and we're accepting it." Smith was in a relationship with Johnston before the confidentiality breach. They broke up in May but have remained friends and business partners, she said. She is figuring out where to take her complaint next and plans to contact a lawyer, she said. The Ontario Information and Privacy Commissioner's office declined to comment because it does not have oversight of children's aid societies. Spokesperson Trell Huether, however, said the agency has been calling for such oversight since 2004. Ministry of Children and Youth Services spokesperson Anne Machowski-Smith said complaints can be made to the CAS, which convenes a review panel, and to the independent Child and Family Services Review Board. The Ontario Ombudsman does not have CAS oversight, but can investigate complaints about the review board. Anne Machowski-Smith could not give a rat's behind about any problems at the Criminal Cartel of Ontario Children's Aid Societies. She is a politician who in reality like decades of prior liberal governments who have supported this government funded and sponsored private Criminal Cartel of child abusers devoid of accountability. Anne Machowski-Smith makes most parents especially fathers want to vomit.